On the Kornati islands, „the nautical paradise“ in the quiet bay of Žakan, you will find a restaurant of the same name. To dock in Žakan means to arrive at a place where everything is completely different, new, but still completely in tune with the 21st century. The gastronomic approach is also modern, but with an atmosphere matching the location. In the tavern Žakan we maintain and respect the traditional food preparation inherited from old Kornati fishermen and farmers merged with selected fresh ingredients which combine specialities irresistible for guests. 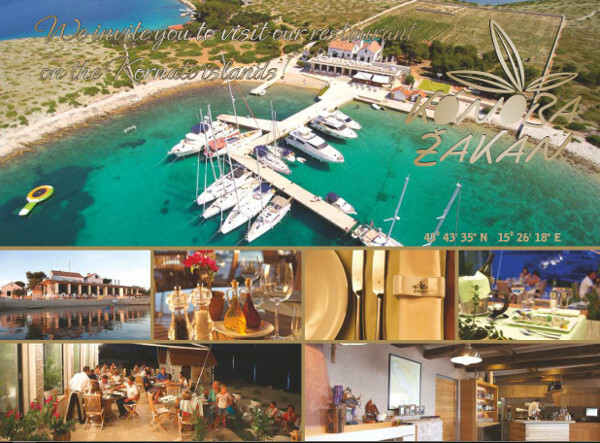 Restaurant Žakan is inevitably the place to visit for both Croatian and visiting sailors on their cruises in the Kornati archipelago. Žakan is an ideal place for a romantic dinner, a pleasant gathering with friends or business associates and for team building. If it is your first visit to Žakan, it is best to relax and try something from the taster menu that contains multiple courses selected according to your taste, with a choice of excellent wines. Whenever you come, we will provide everything to make your stay with us unforgetable. We invite you to become part of a large family whose members, fascinated by the beauty of the Kornati islands and the good food, keep coming back.